The co-founder of the Public Choice Theory and important contributor to Constitutional Economics was born in 1919 in Tennessee. This is where he also studied and received his M.A. in economics in 1941. After his military service he enrolled as a Ph.D. student at the University of Chicago in 1946. Mainly due to the influence of Frank Knight, Buchanan became a persuaded supporter of the free market economy. After his graduation in 1948 he devoted himself to Knut Wicksell’s work on public finance “Finanztheoretische Untersuchungen”, a book little was known about in the USA back then. 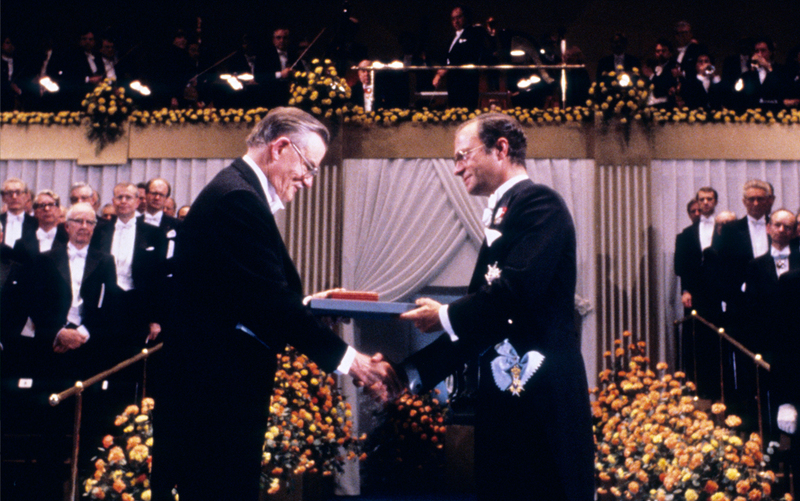 Headerpicture: King Carl Gustav from Sweden presents the Nobel Prize in Economics to James M. Buchanan in 1986 (Foto: danapress).